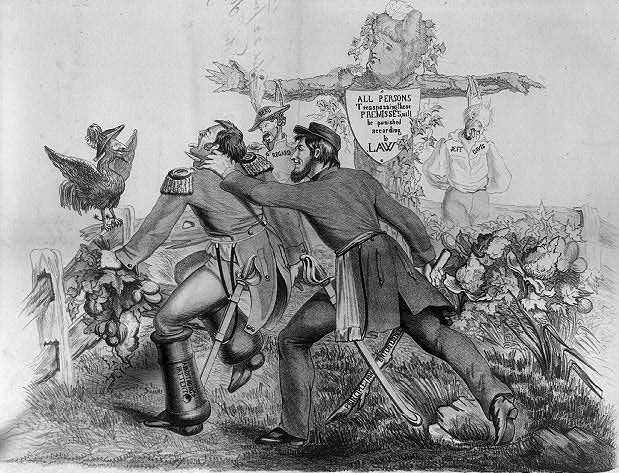 Uncle Sam challenging the interference of John Bull, the personification of Great Britain, in the Civil War, 1861 (Photo: Library of Congress). White, black, and red complexion did not automatically parallel European, African, and Native American heritages, respectively. In fact, Ishmael was described as mulatto; John as Irish; and Andrew was listed as an infantryman in the British 40th regiment, was born in Philadelphia, with no nationality or ethnicity specified. Skin and hair appearance were features related to, but not constitutive of, ethnic or national background (60-61).